Look familiar? The building above would later become the Texas School Book Depository. But prior to that, the building housed Sexton Foods, a Chicago-based wholesale grocer which occupied the building for twenty years (1941-1961). The building was known commonly in town as “the Sexton building,” even after it was leased to the Texas School Book Depository in 1963, which explains why some people — citizens and police officers alike — were still referring to it by that name on the day of the Kennedy assassination (and this has apparently caused confusion amongst those wading deep into the “assassination literature”). The photo above is cropped from an ad I came across in The Dude Wrangler, a dude ranch quarterly (! ), published in Bandera. The ad (which is reproduced in full down the page a bit) is from 1953, but the photo of the building appears to have been taken earlier. 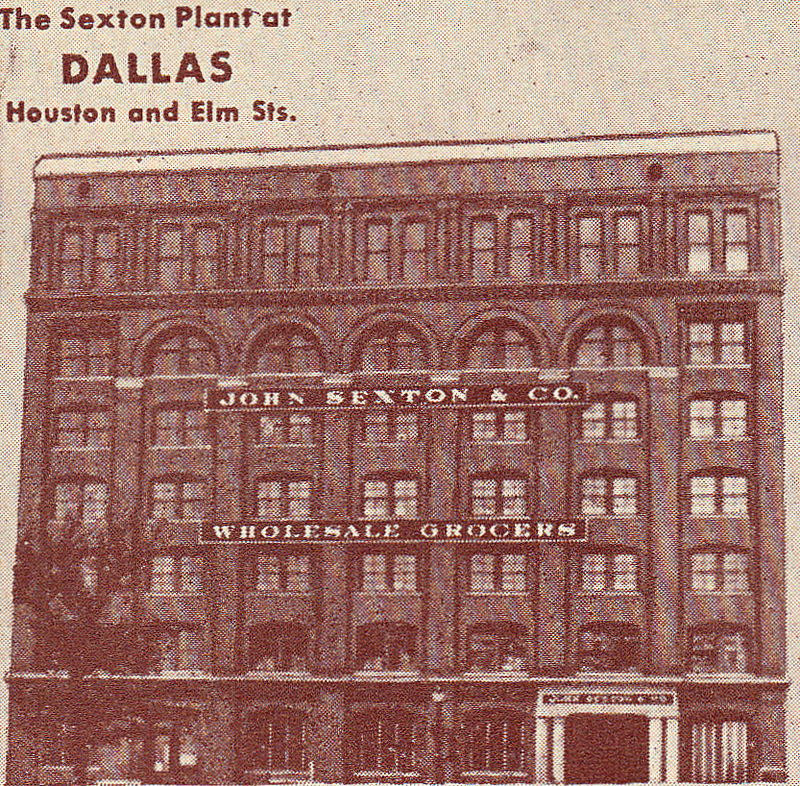 The leasing of the building by D. Harold Byrd to the John Sexton Wholesale Grocery Company of Chicago (initially for only five years) was announced in The Dallas Morning News on Nov. 28, 1940 (“Wholesale Grocery Leases Building at Houston and Elm”). The Sexton Co. was scheduled to move in on Dec. 8 “following a general remodeling which will include installation of elevators, rearranging of partitions and painting.” They remained in the building until 1961. In 1953 (before anyone from Hertz was planning on putting a billboard up there), the Ford people erected a giant neon sign on top of the building to commemorate the 50th anniversary of the founding of the Ford Motor Company. In fact, it was so big that it had half a mile of neon tubing in it and was touted as being the largest animated neon sign in the Southwest. Now there’s a sign that probably caused a few car accidents! Before the Sexton company moved in, the building housed the Perfection-Aire air-conditioning company. Newspaper articles announced the renovation of the building for the A/C people — the company went into receivership a couple of years later. Before that, it was the site of the Southern Rock Island Plow Co., which was the original owner of the property (1894) and which built the building in 1903 after the first building was destroyed in a fire after it was hit by lightning on May 4, 1901. Above, the Southern Rock Island Plow Co. Building which still stands, famous as the “Texas School Book Depository”; below, the building originally built by the plow company which was destroyed by fire in May, 1901. Sexton Co. ad from a 1953 issue of The Dude Wrangler ; the top image is a detail from that ad. 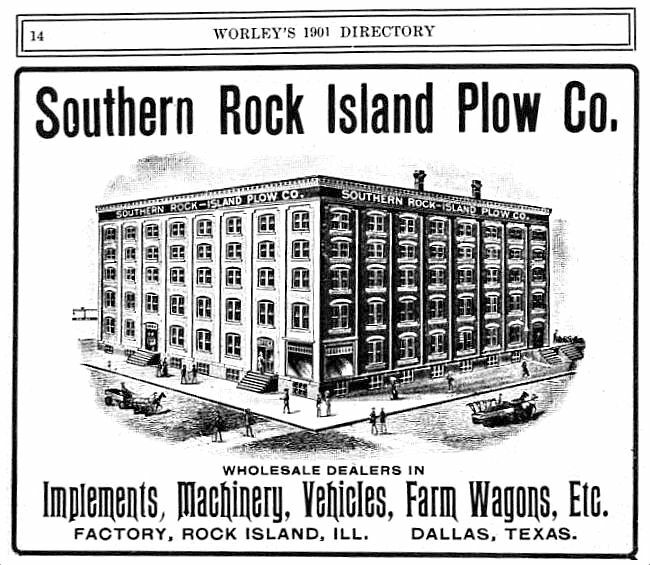 More on the history of the building as it pertains to the Rock Island Plow Co. is here. More on the Sexton Foods Co. is here. More info, specifically on the Texas School Book Depository, is here. Official site of the current occupant, the Sixth Floor Museum, is here. The Sexton building did have another large sign on the roof before the impressive Ford neon sign. You can see in this photo of Dealey Plaza that there is a sign advertising U.S. Royal tires: http://i.imgur.com/BiuYGXj.jpg The photo was probably taken around 1948 because Dealey Plaza does not have the statue of George Dealey which was dedicated in 1949 but the Mercantile Bank Building does have the tower above the clock which was added in 1947. U.S. Royal was a tire brand of U.S. Rubber which later changed its name to Uniroyal. I don’t know when the sign was erected but I am guessing it was after World War II when rubber production for civilian use ramped back up. In my research of the Texas Schoolbook Depository in 1993, I interviewed the former manager of Sexton Ted Leon when it was still at the 411 Elm Street location. He showed me a pocket calendar he had saved, recording the date when the Sexton company moved out of the building, November 14, 1961. I also spoke with George Butler who also worked there, and he said that the building was vacant for at least a year before the schoolbook depository began to move in. Only the first two floors were suitable for offices, and the third through seventh floors were for warehousing their products. The schoolbook company had to do a lot of work to transform the third and fourth floors into office areas, plus add a passenger elevator that was not there before. Thanks for the additional info, William!